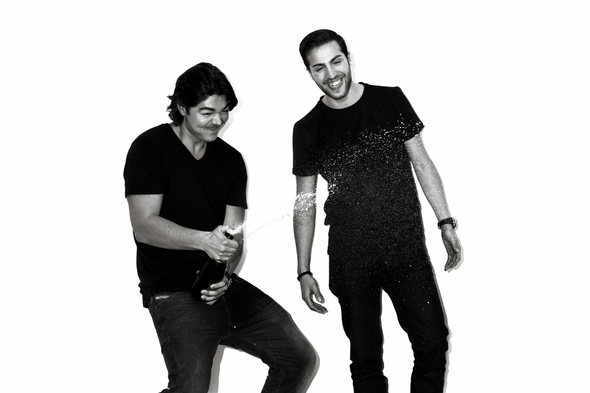 This Monday, 3rd September long-time friends and collaborators AN21 & Max Vangeli are set to release their debut album ‘People Of The Night’ on Size Records. Bringing together a host of like-minded producers and vocalists, the album’s blend of emotive and anthemic house is set to cement their positions in their field. At 15 tracks the album is a bold creative statement, but one that pays off fully as it allows the pair to articulate the depth of their musical talents in the broadest way yet. All three singles feature here, from the powerful and uncompromising ‘H8RS’ with Steve Angello, to the eponymous big room anthem with Tiësto and Lover Lover, as well as latest single ‘Bombs Over Capitals’. With Congorock, Michael Woods, Moguai and Kim Fai all pitching in on production duties as well as guest vocal appearances from Bnann, Rudy and Example, the duo amalgamate the diversity of these acts in to the influences that run through the album. From the soaring synths and beautiful melodies of ‘Glow’ to their gritty electro collision with Congorock on ‘Lost’, each track offers something new and unpredictable. On further vocal tracks ‘Whisper’ featuring chart topper Example and ‘This Far’ with Rudy they bring their songwriting to the fore while the stripped back melodies and driving club groove on ‘Diet’ to the harder-edged urgency of ‘Square One’ highlight the solo instrumentals. Elsewhere they team up with Michael Woods on ‘Nightfall’, Moguai on the morphing ‘Brunette’ and Kim Fai on ‘Story’.